This project was the other one that I tweaked at the retreat last weekend. Michele had created this project with the Web Wishes stamp set. We had been joking about "frog princes" and when I realized that this project included Dentyne Ice cinnamon gum AND the All Wrapped Up stamp set was sitting right next to me, the wheels in my twisted head started turning. I started with a 5 3/4 x 4 inch piece of Real Red cardstock. The Basic Black cardstock is measured at 2 1/4 x 3 3/4 inches. The Confetti White cardstock is measured at 2 x 3 1/2 inches. I stamped the jar image using Basic Black ink. ***If you want the image to pop a bit more, you could stamp with VersaMark ink and sprinkle with Black Embossing Powder and emboss it with a Heat Tool. I used the "masking technique" with the frogs, so they didn't look like they overlapped each other. The directions may seem a little overwhelming at first, but once you execute the masking technique the first time, it's a breeze the next time you do it. Here's a quick run-down on how to do the masking techniue, which I got from Stampin' UP's Stampin' Ideas and Techniques portion of their web site. 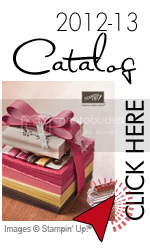 You can view Stampin' UP! 's finished project HERE. Here's my finished project, with the gum pulled up. I stamped a bunch of frogs, using my frog mask, to fill up the jar. To color them in, I swiped color from the Stampin' Write Markers on the plastic lid of the stamp set and used the Aquapainter to dilute the marker ink and use it as paint. For the two greens that I colored the frogs in with, I used Green Galore and Old Olive. To draw the lips on the frogs, as well as the hand lettering for the "Pucker Up!" at the top of the project, I used the fine point tip of the Real Red Stampin' Write Marker. I created a little bit of shadowing and dimension under and on the sides of the jar with the Bashful Blue Stampin' Write Marker and the Aquapainter. I adhered the project together on one of the sides with SNAIL Adhesive. I then punched a hole through both sides at the top of the project using the 1/4 inch hole punch. I cut two pieces each of Black and Red Gingham Ribbon at 14 inches long. I threaded the ribbon through both holes and placed the gum (make sure to take it out of the original sleeve it came in) on the ribbon and pushed it down into the project, then tied a double knot in the ribbon pretty close to the top of the project. You don't want to do it too tight so that the gum doesn't budge, but you also don't want to do it too loose or the gum will slide around too much. I did my knot about 1/4 inch above the packet of gum. 1) Stamp the image with a VersaMark Pad. 2) Use sponge daubers to apply the pastel color directly to the ink. 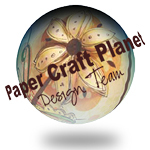 If you have a finely designed image, you can use a Q-tip (I find that the cheap dollar store Q-tips work best, as their heads are woven much tighter than the Q-tip brand......they're horrid on your ears, but work GREAT with our Stampin' Pastels. ***TIP***: Use a Pastel Eraser (2 erasers for only $2.50!!!!) to erase any unwanted color. ***TIP***: To avoid smearing, gently dab the chalk rather than rubbing it across the image. For the background on the Tempting Turquoise card base, I used the VersaMark ink to create a tone-on-tone background. Supplies: Bud Basics and Wonderful Words stamp sets, Tempting Turquoise, Green Galore and Whisper White Cardstock, VersaMark ink, Basic Black ink, Tempting Turquoise and Green Galore Stampin' Pastels. Baby Wipes are my newest favorite stamping accessory! On the 2005 Stampin' UP cruise, baby wipes and reinkers were introduced as an all-new technique. I LOVED it from the moment I saw it demonstrated at the Technique Showcase! I've been playing around with baby wipes, re-inkers, chalks and more since then. The Bud Basics set is one of my all-time favorites right now. Total bummer that it's going to be unavailable after August 31st (so if you've been eyeing it for a while, NOW is the time to order it). SU gave us this set, along with the Jumbo Basics Outline Wheel, as our freebie on this year's cruise to the Mexican Riviera (back in March). I hope, hope, HOPE this set and the wheels make it into next year's catalog. Anyway.........I've been having a ton of fun with this set, and with some great colors. 1) Fold a baby wipe in quarters. 2) Place one dot each of 2-4 different color ink refills (aka: re-inkers) in a horizontal line on the baby wipe. 3) Swipe your baby wipe across the Glossy cardstock. Yup, it's THAT easy. You can re-swipe the opposite direction to create your own plaid, as well as tap the cardstock with your baby wipe to created a mottled effect. You can also put your color on in a swirling motion for an even funkier look. Make sure that you let your ink dry on the Glossy cardstock before touching it. You don't want any unnecessary fingerprints on there. I used a sponge dauber to add some extra color around the edges of my cardstock to give the edges some definition. I also stamped the flower image on Glossy cardstock. I used the sponge daubers again with Apricot Appeal to sponge around the edges of the glossy cardstock that I stamped the flower image on, as well as used the dauber to put a spot of color in the center of the flower. Supplies: Bud Basics and Sincere Salutations stamp sets, Pretty in Pink, Certainly Celery and Summer Sun ink refills, Apricot Appeal, Pretty in Pink, Certainly Celery, Regal Rose and Basic Black Classic Stampin' Pads, Apricot Appeal, Certainly Celery and Glossy White cardstock, sponge daubers, baby wipe. To follow up the post below this one, here's one of the projects we created at the July Class, with instructions under the picture. Click on the picture for a larger view. This card was created using the Heated Pearls Technique (the strip of textured blue and green on the left side of the card). Heated Pearls is A LOT of fun! I did it for a swap for last year's cruise to the Western Caribbean and I think I smelled too much heated glue....that kept me away from this technique for over a year. Now that my brain cells have regenerated themselves, I was up to the challenge again. I found a great layout using another set over at SplitCoastStampers and used the layout concept that Amy05 created. She has another cool Heated Pearls Sample using the same set as her first sample....the VERY awesome Nature Prints set from the Stampin' UP Summer Mini Catalog. 1) Mix together regular school glue and Turquiose Pearl Ex. 2) Use a paintbrush to spread the Turquoise colored glue onto a piece of cardstock (I used Whisper White for this card). 3) Sprinkle Spring Green Pearl Ex in random places on top of the Turquoise colored glue. 4) Use a heat tool (embossing gun) to heat the glue. Don't worry about the bubbles....that's supposed to happen. 5) Once the glue stops bubbling, your Heated Pearls are done. Here's another variations of this technique over at SplitCoastStampers Tutorials done by Beate Johns.